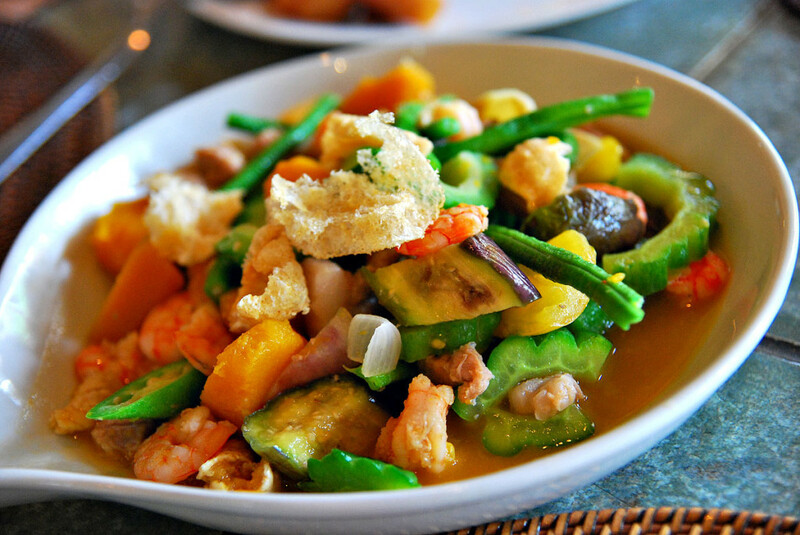 Pinakbet is originally an Ilocano dish, but it’s popular all over the Philippines. Many other regions have their own versions of the pinakbet. But, of course, the Ilocanos still make the best pinakbet. Pinakbet is a vegetarian dish that is perfect for those who are on diet. In a small pot, boil the bagoong in the water until it has dissolved. In the pot where the pinakbet will be cooked, put the following vegetables in a layering order: minced onions, tomatoes, ginger, eggplants, string beans, and okra. Then strain the boiled bagoong before pouring the broth on the vegetable pot. Discard the rest of the bagoong. Put the fire on high and when it starts to boil, lower the heat to simmer. Be careful not to burn the vegetables. This will take not more than 25 minutes. Do not mix the vegetables with a spoon while simmering the dish. Why not? It's a cooking secret! Remember that the pinakbet is done when the vegetables appears "wrinkled". The way my Ilocano grandmother make pinakbet is that she first sautee the garlic, onion, ginger and pork until juice is rendered from the tomatoes and a bit reduced. Then she boils the fish bagoong in substantial water. When the bagoong in water boils she places all the vegetables in layers, e.g. sweet potatoes (kamote), string beans first then lima beans, ampalaya, okra then the eggplant. Then she pours the sauteed ingredients on top and covers the pot until the whole vegetable stew is cooked. When it is already cooked, she stirs and mixes everything carefully once before serving. Yup, actually there are many variations in the method of cooking pinakbet. Perhaps for those who prefer fat-free pinakbet, they can try the recipe posted. I also saute the garlic, and onions with some pork strips and shrimp to make it a one-dish meal. I don’t put tomato so that it won’t spoil at once. To make it even tastier, I’d remove the shrimp’s head and then pound them using a pestle and mortar. Or using a sharp knife, I’d finely chop the shrimps’ head until the juice is extracted. Then, the shrimp juice is extracted and using a strainer, it is poured into the sauteed ingredients. Let it boil. Then, the vegetables now can be added in a layering order and cooked in slow fire. Before serving, the dish is carefully stirred and served hot.